As a kid I was a major Batman fan. I don't know what happened to my countless drawings. My early drawings were pretty much all the same. 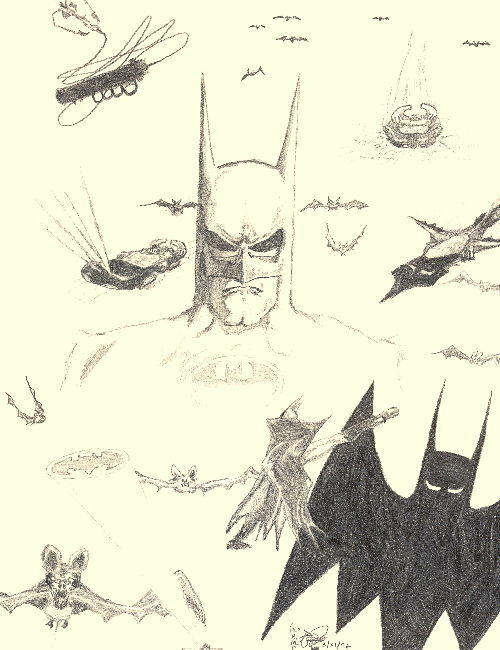 I nearly always drew Batman standing at attention, doing nothing. Truth be told, I didn't know how to draw much else. Since I am a self-taught artist with very little formal training I still don't know how to draw much! This drawing shows a slight departure from the standard boring ones of years prior. Like many fans, I was quite inspired by the 1989 Batman movie with Michael Keaton and Jack Nicholson. Several of my best drawings were created in the early 90s as an homage to my childhood hero. Interest in Batman waned considerably in my later teen years. Even though I had a great interest in the black costumes and vehicles introduced by Tim Burton, I still preferred the blue and grey comic book version. The elements in this drawing most closely resemble the drawing styles found in comic books of the period. Obviously the paper I used wasn't acid free. This drawing shows more aging than most.